Imagine you are relaxing at a little bistro in Southern France. What would your ideal meal be? What wines would you pair with an exquisite lunch? It’s nice to imagine. But what if traveling to France is not possible right now? 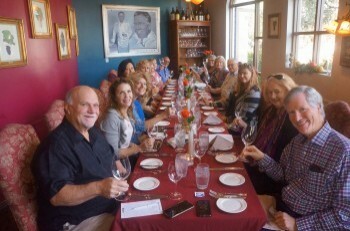 My suggestion is to dine at Pascal Cafe in San Juan Capistrano. It is the next best thing to really being in France. Maybe it’s even better. 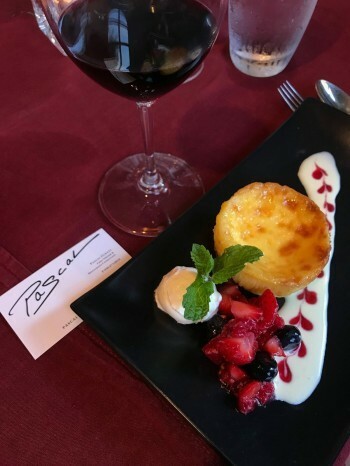 Pascal’s is an all-encompassing culinary stop—a deli, bakery, wine bar and destination for an elegant French lunch or dinner. Our table was beautifully set for 15. 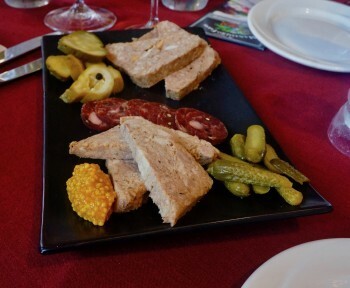 We were first treated to a charcuterie platter featuring house-made pistachio country pate, tender pork rillettes, and duck sausage with house-made mustard, and pickles made from local, farm-picked cucumbers. I doubt if I have ever had a more appealing charcuterie platter. The combination of herbaceous and earthy flavors with the tang of the mustard and sharpness of the pickles was wonderful. We were also served small onion tarts and pesto tomato tarts, which were flaky and delicious. It was hard not to fill up on these appetizers, but I knew we needed to save room for the special dishes to come. The Salade Lyonnaise served next was as beautiful to behold as it was to taste. 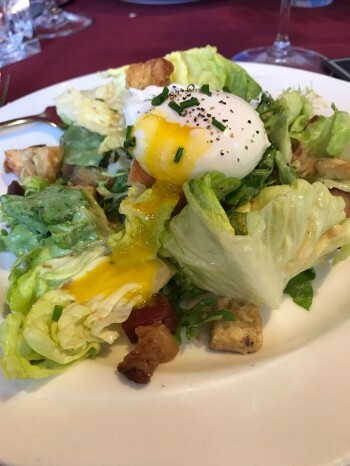 Exuding flavors of France with each bite, this classic salad (which originated in Chef Pascal’s hometown of Lyon) consisted of crisp butter lettuce and peppery frisee, mixed with rich smoked bacon lardons and topped with a perfectly poached egg. I mixed the egg with the savory Dijon mustard dressing already on the salad, lightly coating the greens, and the result was heavenly bliss. This was by far the best salad I tasted in 2017 — and perhaps the best of the century so far. 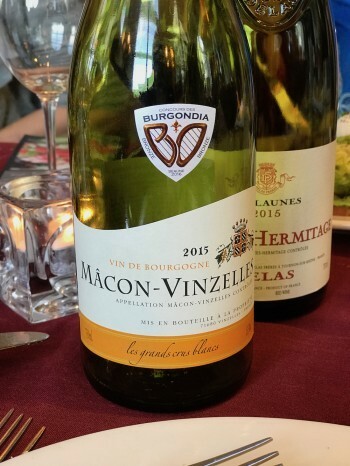 The salad and appetizer courses were accompanied by a lovely 2015 Vin De Bourgogne from the Macon-Vinzelles vineyards. This crispy, fruity White Burgundy was a particularly nice complement to the fresh salad. My approach was two bites of salad and then a sip of wine—an approach that worked beautifully. 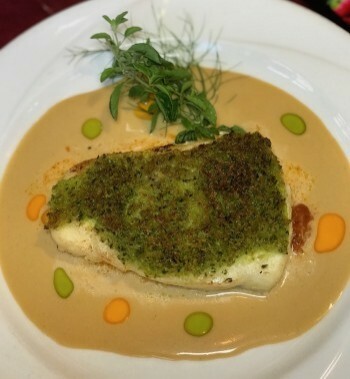 While we usually think of fish being paired with white wine, this flavorful sea bass dish was perfectly paired with a rich, elegant Syrah — 2015 Dellas Freres Les Launes from Crozes-Hermitage. The ripe plum and blackberry flavors were full of spice and went surprisingly well with the sea bass and its rich sauce. Dessert was a decadent Macanese egg custard tart with a berry compote. The term “melt-in-your-mouth” must have been created to describe this creamy, smooth custard in its flaky crust. We learned that Chef Pascal based this dish on a tart he discovered during his time in Macau. Throughout our meal, Chef Pascal described the dishes we were served and told us a bit about his fascinating and impressive background. 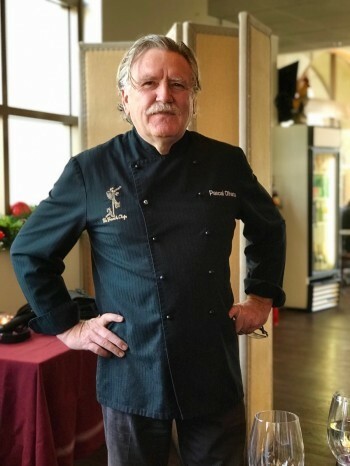 Pascal moved to Orange County from St. Tropez more than 40 years ago, after working with some of the most celebrated chefs in France and Europe, and was one of the first chefs to bring Southern French cuisine to Southern California, where he worked at several top restaurants before establishing his own business. Besides Pascal’s, he also owns two other restaurants and Manassero Farm, located in the Irvine area, where he grows produce for his restaurants. Chef Pascal’s dishes feature local and seasonal fresh produce as much as possible. Monday through Friday: 7:00 a.m. to 8 p.m.
Pascal’s Experience: Thursday through Saturday, starting at 6 p.m. This is a prix fixe, four-course experience limited to 24 guests. Reservations can be made via Open Table or by calling 951-907-9701. Pascal’s other restaurants are Café Jardin and the Tea Garden Creperie at Sherman Gardens in Newport Beach.